The High Quality Replacment AC Adapter Available for use With Listed Laptop Models Only. Please Note If an Exact Adapter Part Number is not Available in Stock Then We May Supply a 100% Compatible Part Number. We are Dispatching premium Quality Replacement Adapters as shown in the PICTURE for use with IBM and Panasonic Laptops This is a Round Pin With 5.5MM x 2.5MM Connector – TO BE USED WITH LISTED LAPTOP MODELS ONLY PLEASE DO NOT PURCHASE BASED ON PART NUMBERS PLEASE CHECK THE PICTURE; PART NUMBERS CAN BE SIMILAR WITH DIFFERENT PIN SIZES. 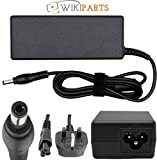 This Replacement Laptop DC Power Adapter/Car Charger for your laptop enables you to operate your notebook or charge the battery from your Car Cigarette lighter. If you are running your computer on DC power with a battery installed, the adapter charges the battery (if needed) and maintains its charge. When the system is off, the DC adapter will charge the battery and then maintain its charge. Overvoltage and Overcurrent Protection Circuits built in – In the event of a power surge the Power Supply will blow before it damages your equipment.